"No Washington Exemption from Obamacare!" 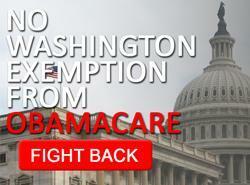 No Washington Exemption from Obamacare! UPDATE 8/10/2015: Judicial Watch has filed a lawsuit challenging Congress's fraudulent claim to be a small business. Unfortunately, before Congress left for recess Senator Ted Cruz's amendment to the highway bill that would END Congress's scheme to sidestep Obamacare was BLOCKED from receiving a vote. We will update again the next time there is an opportunity to get a vote. The American people insisted on language in Obamacare dropping employer coverage for members of Congress and their staff and requiring them to go into the new health care exchanges. Just like other Americans being dumped into Obamacare exchanges, they stood to lose their employer contributions, in this case the generous financing of their health benefits by taxpayers. But unlike all of the other Americans, Congress had access to President Obama to personally intervene. And he did, with an OPM rule allowing them to avoid the costs of being dumped into Obamacare exchanges by having taxpayers keep paying their premiums. That's wrong. And because there is no mechanism for employer contributions in the regular Obamacare exchange, Congress filed false documents claiming the House and Senate each have less than 50 employees to qualify for the "small business" exchange. More than 13,700 employees have since signed up. That's fraud. 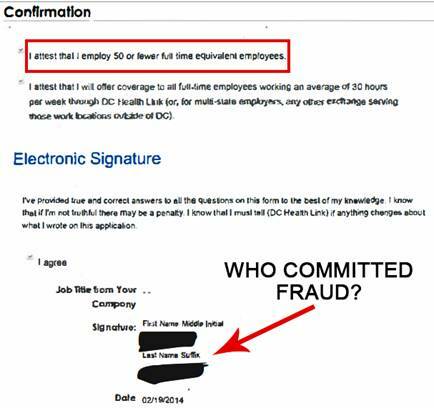 Congress is concealing the fraud by refusing to disclose who signed the false documents, most recently by blocking a proposed subpoena by Senate Small Business Committee Chairman David Vitter. Sign below to tell Congress to END this FRAUD and STOP Washington’s exemption from Obamacare!